Once upon a time, I had no idea that frozen grapes were such a thing. I just knew that I desperately, wildly craved them. 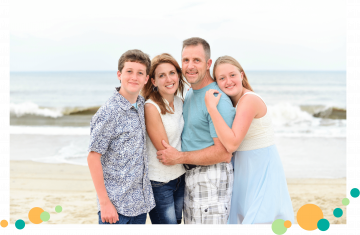 This all started a couple of summers ago, when I was doing a lot of running out in the sweltering heat (because, well … this). After a run, I’d joyously stuff my face with the cold, sweet, refreshing grapes I had waiting for me in the fridge. But I wanted more! Colder … refreshing-er. 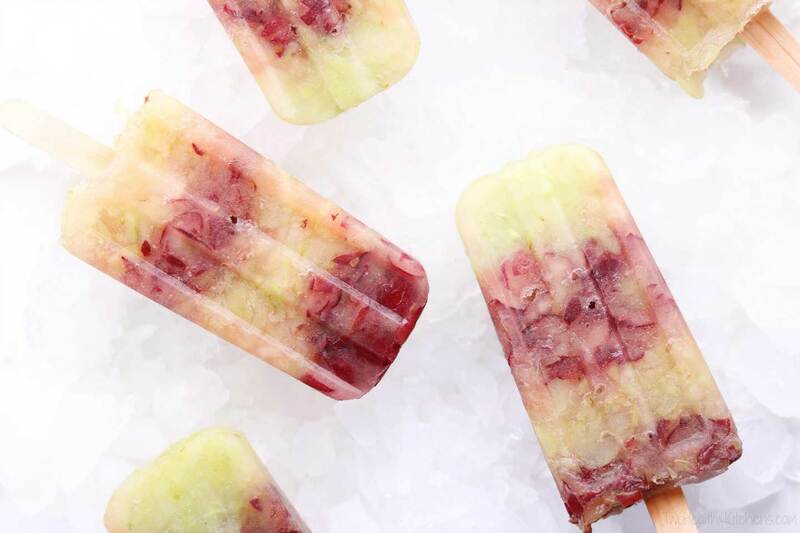 These grape popsicles were the obvious next step. They’ve got the colder thing going on (since, you know, frozen is colder! ), and they sure do have the refreshing thing going on. After a run in the hot, muggy, summer heat, these are about as icy-cold-refreshing as refreshing can possibly get! The very same weekend that I first created these popsicles, we happened to be at my sister-in-law’s. I went to get something out of her freezer, and what did I spy there? A huge bowl of frozen grapes, waiting for her post-workout snacks. Huh! Maybe I was on to something! A little research, and I quickly realized … frozen grapes really are a thing! I’m not the only one who craves this sweet, frosty, refreshing little snack! 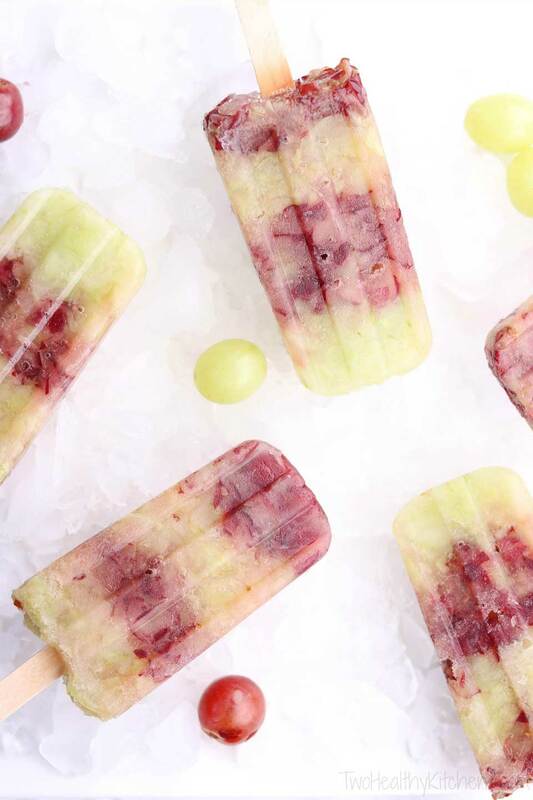 But frozen grapes on a stick (you know … aka grape popsicles) elevate that whole frozen grape concept to an even more fabulous level because they’re so portable! I happily grab one from the freezer and walk with it while I cool down. The little bits of grape are somehow even more delightful than entire frozen grapes. Plus, it’s pretty much a universal truth that food on a stick is just more fun. I don’t know why, but it’s true! Perfect. Oh my gosh, so very perfect. It’s honestly what I daydream about mid-run: about the moment when I get to celebrate with my grape popsicle. I’m totally not kidding. These are my daydream, and I’m not even one bit ashamed to admit it! 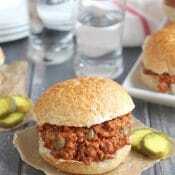 And this is absolutely a snack you can feel good about! 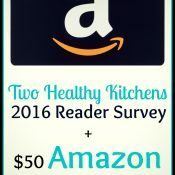 One simple, all-natural, nutrient-filled ingredient! But as simple as these grape popsicles seem, it wouldn’t be THK if I didn’t have a few tips to share, just to make your life easier! 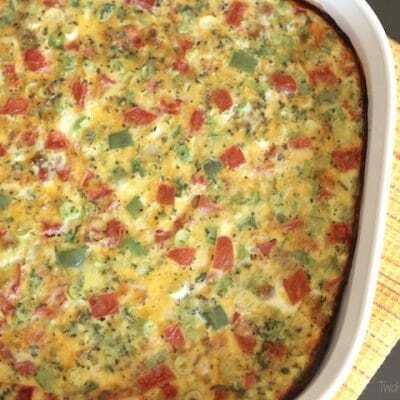 Any seedless table grapes will work for this recipe. My favorites are the sweet, purple-y red ones, but you can mix it up by using green grapes or even black. What’s important, though, is that you use good grapes. Because these popsicles are so very simple, with only one ingredient, that one ingredient is absolutely key. 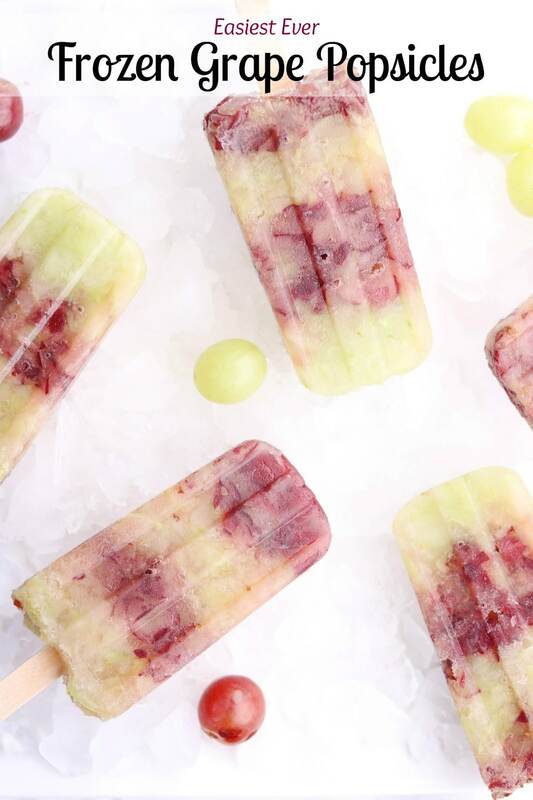 Don’t make these with subpar grapes, or you’ll just end up with subpar popsicles. Makes sense, right? You definitely want to use really sweet, flavorful grapes. This is especially true because freezing can dull the perception of sweetness a little (this happens with any fruit-based popsicle). 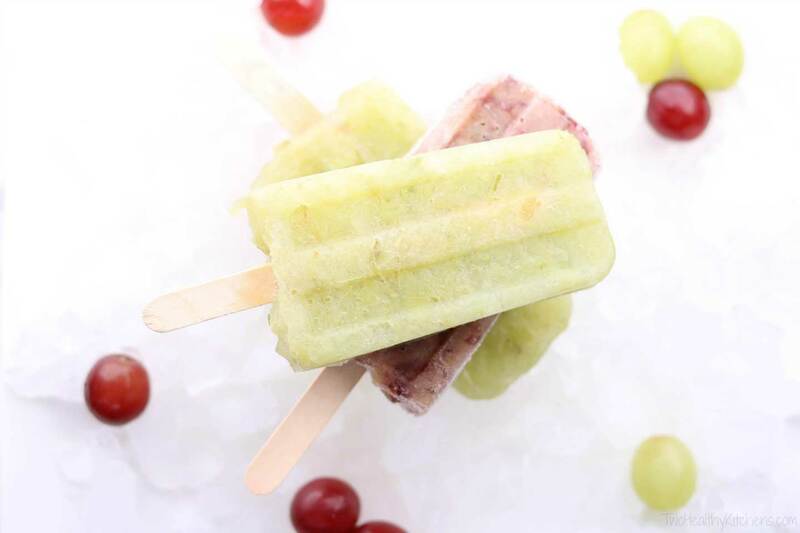 One more flavor note: I often find that green grapes tend to be a little less sweet than red or black ones, so they yield a refreshingly more tart popsicle, with a flavor that’s sometimes almost a little like a Granny Smith apple. 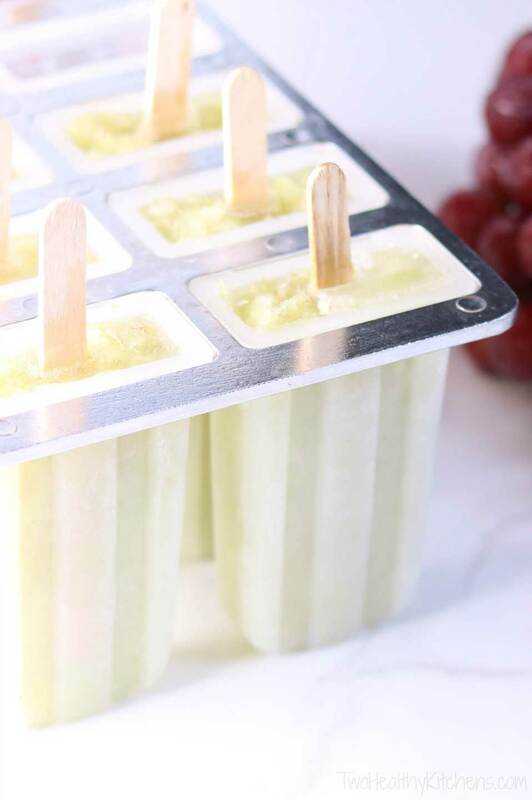 Bottom line is that you definitely control the flavor profile of your finished popsicles with the flavor and sweetness of the grapes you start with. 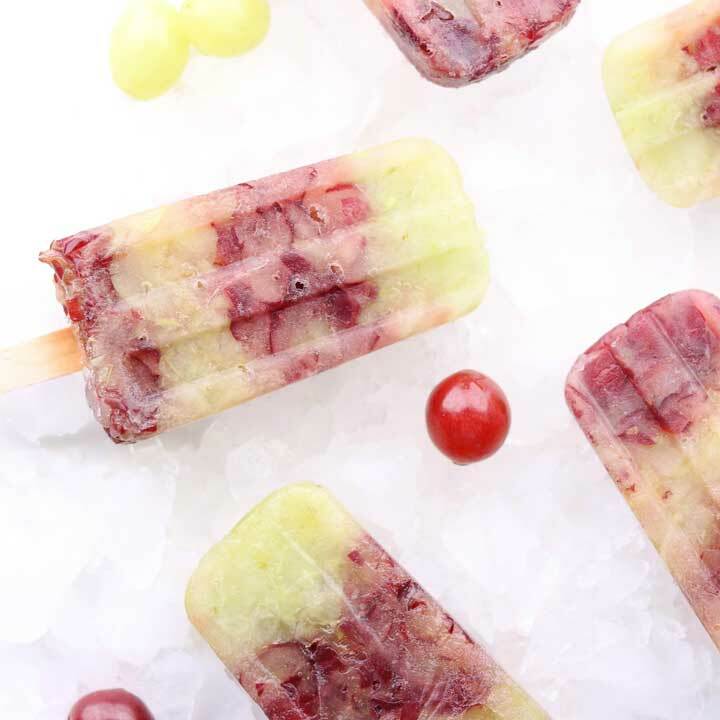 When I first made these popsicles, I really wanted them to have big, burstingly refreshing chunks of grapes in them, and I still prefer mine that way, even after making them with a whole range of different textures. 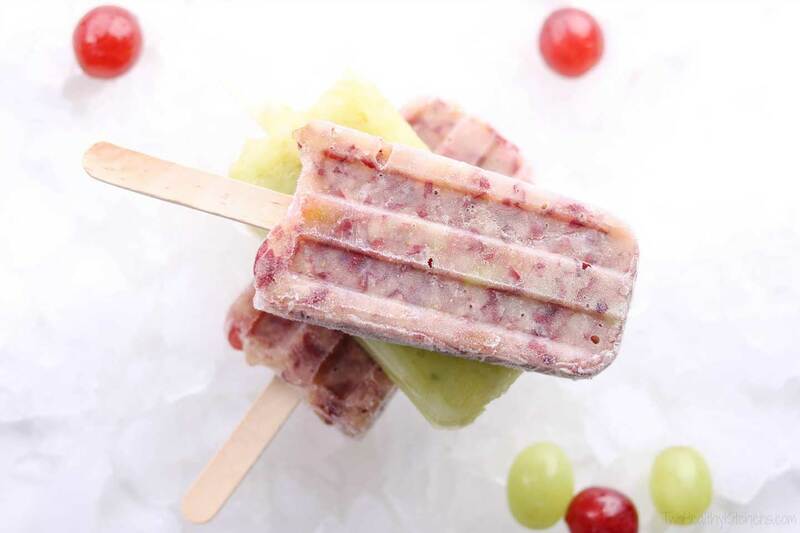 My favorite version of these popsicles has big chunks – even bits as big as a quarter or a half grape in places, mixed in with other slightly smaller bits. To achieve that, I typically find that I need just 3-5 quick pulses in my blender/processor. I prefer to make my grape pops with larger chunks of grapes, as shown on the right. If you prefer a slightly smoother texture, you could try making your pops with smaller bits of grapes, as pictured on the left. 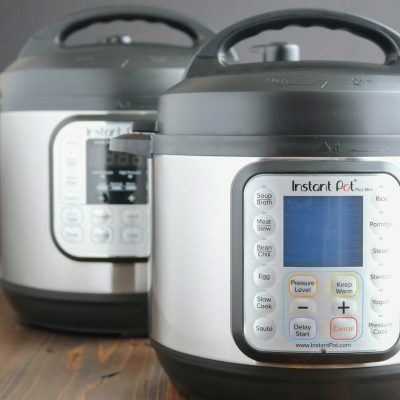 Just be sure not to puree them more than that, or to process them into juice. But again, you’re in total control here. Want a smoother consistency? Just pulse an extra time or two. 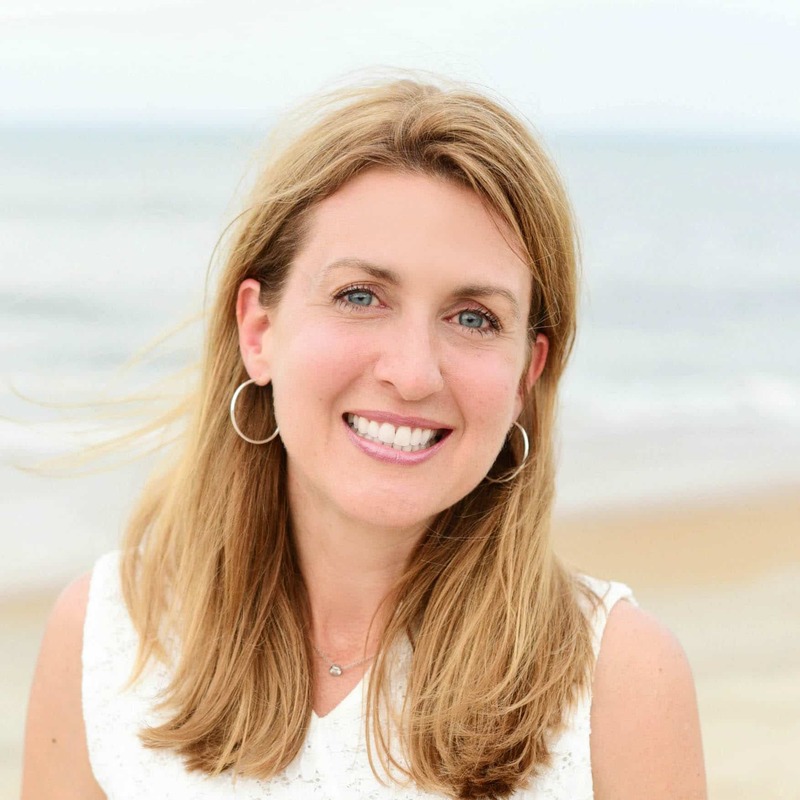 What you don’t want is to process the grapes into juice – that’s not really the point. 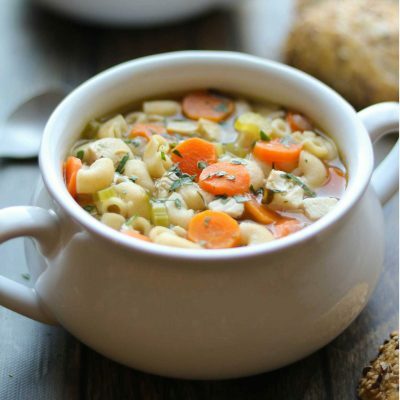 We’re not going for a smooth puree here at all (somehow, that just isn’t nearly as good as frozen chunks), so be careful not to go too far with that pureeing! Regardless of how big most of your grape chunks are, you’ll end up with a little juice in the bottom of the blender, which is absolutely desirable – perfect for “gluing” the bits of grapes together as they freeze into popsicles. Love the fun look of the pretty striped popsicles? It’s so easy! 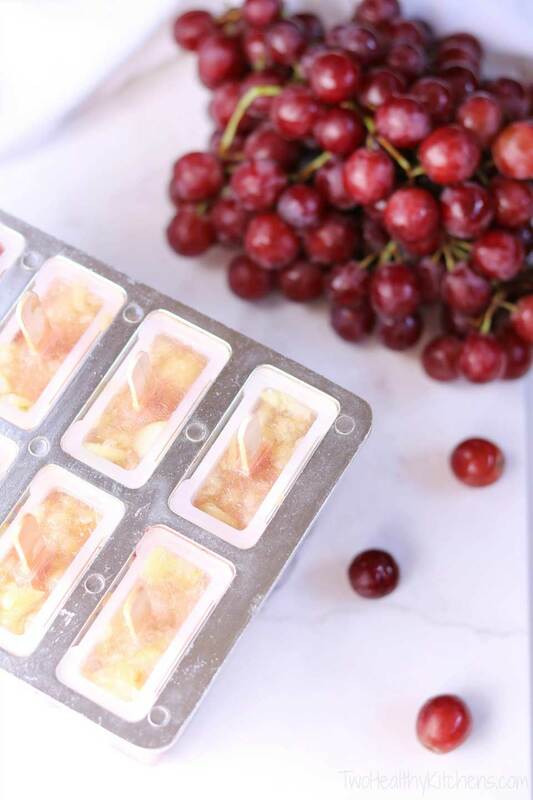 Because you’re not pureeing the grapes into a liquid, you don’t even have to wait for each layer to freeze before adding the next layer! 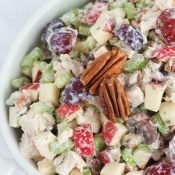 The colors easily stay separated, and you get a wider range of flavors – with stripes of tart green grapes, along with stripes of sweeter red grapes, for example – all in one pretty pop! Didn’t know that frozen grapes are a thing? Now ya do! Put grapes into a blender or food processor and pulse just briefly, about 3-5 times. Although you can vary the exact consistency (from very large chunks to smaller bits of grapes), you want to be careful not to fully puree or completely liquify the grapes. 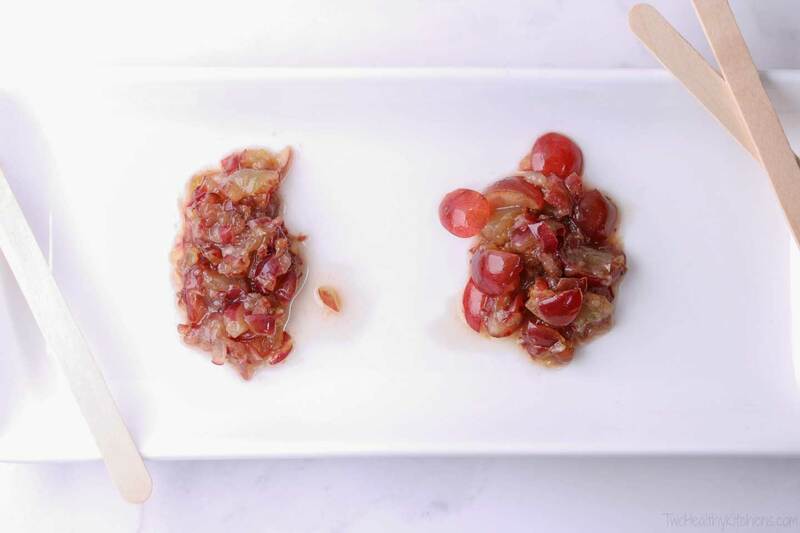 Spoon the grape chunks into six 3-ounce popsicle molds, dividing evenly. Gently tap the molds on the countertop or use the spoon to press the grapes down, so the grape chunks are tightly compacted without air pockets. Pour any grape juice that remains in the blender/processor evenly over all the pops. This little bit of liquid will help to "glue" the bits of frozen grapes together as the popsicles freeze. 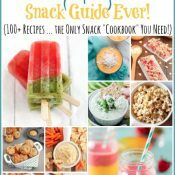 Quantities: As I mentioned in the post, popsicle molds with six 3-ounce compartments seem to be the most prevalent, so I wrote this recipe for that amount. If your mold has four 3-ounce compartments, start with 2 cups of grapes (measured in dry measuring cups). Alternately, if your mold has eight 3-ounce compartments, start with 4 cups of grapes. 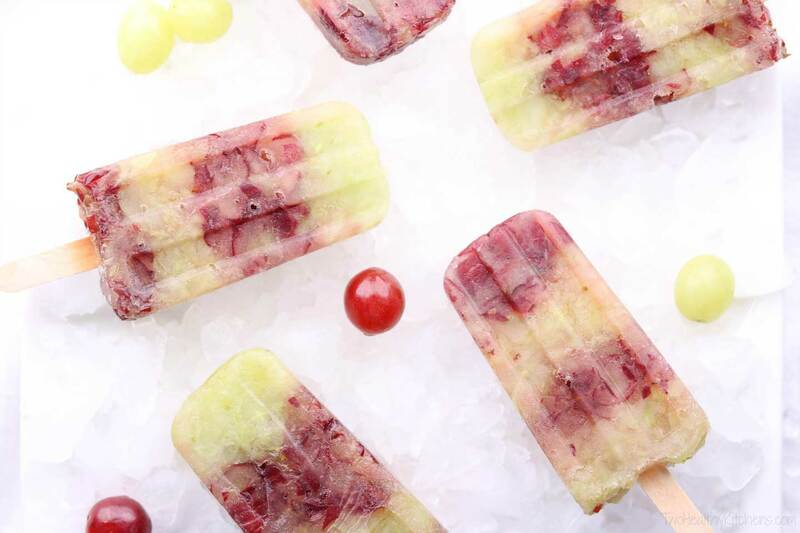 Varieties: Any seedless table grape will work for this recipe, but the quality, sweetness and flavor of the grapes you start with will have a big impact on how your grape popsicles taste once frozen. Green grapes tend to be a little less sweet, for example. Regardless of the variety, always choose good grapes – ones that are fresh and really flavorful. 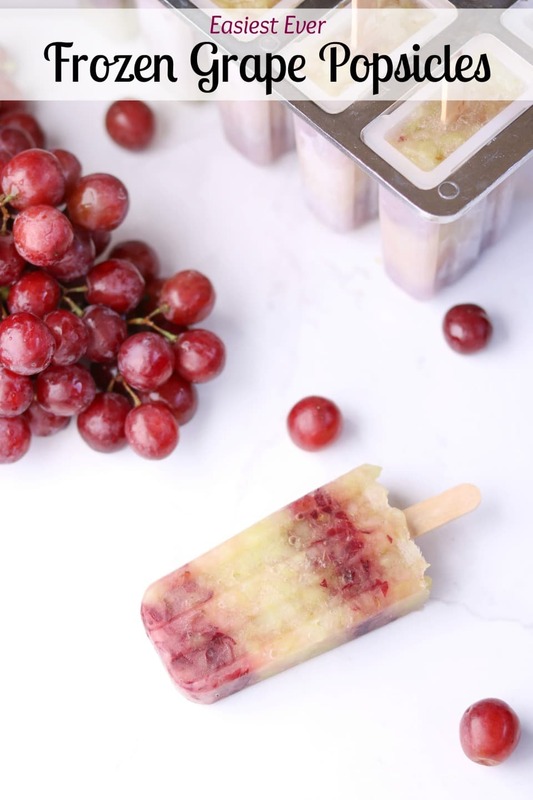 To make striped popsicles: To make six 3-ounce pops, you need to begin with 2½ cups of grapes, in whatever proportions or colors you choose. For the two-color pops pictured in this post, I started with 1¼ cups of green grapes and 1¼ cups of red. 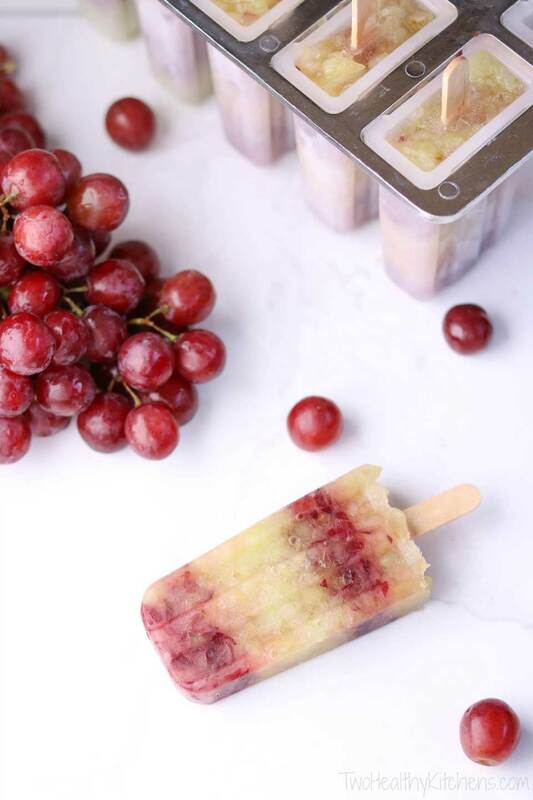 Blend each type of grape separately, and then carefully spoon each type of grape into your popsicle molds in 3-5 stripes, layering one on top of the other and gently pressing down on the grapes as you layer them so there are no air pockets to prevent the pops from holding together. Once you've spooned all the grapes into the molds, pour the remaining juice evenly over the pops, noting however, that you may choose not to use darker juice from red or black grapes, as that may slightly discolor lighter layers of green grapes. Long-term storage: Once your pops are frozen, if you want to remove them from the molds (so, for example, you can use the molds to make more pops! ), the best way to store your pops is individually wrapped in plastic, and then stored together in a large freezer bag. The kids are going to love making these and I’m going to love eating them. Very impressed on the cutting of grapes in small pieces- makes perfect sense! I like the “stripe” too. I love homemade popsicles. 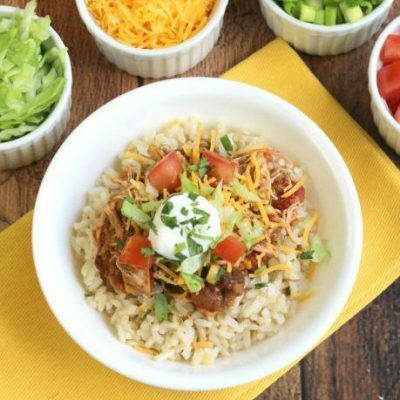 Have to try this recipe.